Creamy white when closed tight, the popular lisianthus flower more than surprises when its buds gradually unfurl in a profusion of bright purple. This unique double-bloom variety will help you create very full bouquets and will look particularly stunning when used to complement the elegance of white or silver. Your lisianthus flowers are picked at just the right moment, custom-packaged, and air-shipped that same day to arrive in all their glory direct from the grower, ensuring you flowers that are the most exquisite and longest lasting you’ll find anywhere. Lisianthus open up in 3 to 5 days. Prepare your flower containers by cleaning them with mild soap and a drop of bleach or by using disinfecting wipes. This will clean any residues and kill bacteria that might shorten the life of the lisianthus. Glass and plastic are the best materials to contain flowers. We do not recommend placing the lisianthus directly into containers that are metal, rusted, or made of clay or stone. 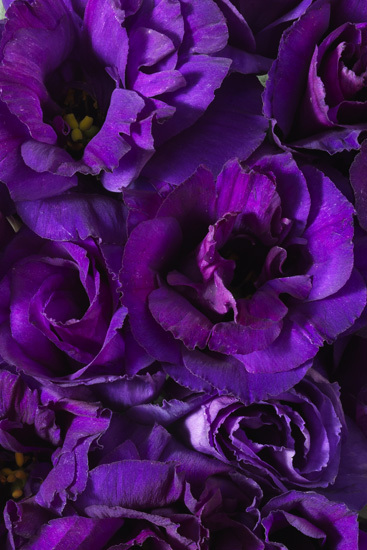 These materials are porous and may contain harmful elements to your flowers. Fill containers with warm, room temperature water. Cold water is not readily absorbed and hot water can shock the flower. Remove all foliage that will fall below the water line. Allowing them to decompose in water will allow harmful bacteria to shorten the life of the flowers. We recommend cutting the lisianthus stems underwater at an angle for best results. Flowers last longer when kept in deep water. Be careful not to let moisture remain on the petals of the lisianthus as this can lead to discoloration and mildew. Lisianthus will take up to 5 hours to hydrate. The temperature in which you store your flowers is very important. Warmer temps will cause the flower to open quicker. Flowers last best in temperatures around 45 degrees. Do not store in the refrigerator. Keep flowers out of direct light in a place with good air circulation. Cigarette smoking is harmful to flowers. Once the lisianthus begin to bloom, place them in an area with less light so they will last longer. Smaller buds on the stem may gradually open, although most do not. This is normal.